P2035 P2035N P2055D P2055DN P2055X. l 12 months Warranty. You Will Receive The Following l READY TO USE. And we only buy from the best suppliers. Canon Pixma MG3150. Canon Pixma MG3155. Canon Pixma MG3250. Canon Pixma MG3550. Compatible with popular PIXMA printers, see below for more info;. Canon Pixma MG2100. Canon Pixma MG2150. Canon Pixma MG2250. L READY TO USE. Laserjet 3600 3600N 3600DN 3800 3800N 3800DN 3800DTN CP3505 CP3505N CP3505DN. SG2100 SG2100W SG2100L SG2100LW SG2100N SG2100NW. SG3100 SG3100W SG3100DN SG3100DNW SG3100SN SG3100SNW. SG2100 SG2010 SG3100 SG3110 SG3120 SG7100 SGK3100 SP200. for these RICOH Aficio series printers. 1 x T2914 - YELLOW empty refillable plus 4 syringe and needle. ISO9001 AND ISO140001 CERTIFIED MANUFACTURER. UP TO 2 YEARS SHELF LIFE. VACUUM SEALED. HP Deskjet 3070A e-All-in-One. HP Deskjet 3070A e-All-in-One Printer - B611 serie. HP Deskjet D4260. HP Deskjet D4263. HP Deskjet D4360. HP Officejet 4620. HP Officejet J5780. HP Officejet J6410. Canon Pixma iP2850. Canon Pixma MG2450. Canon Pixma MG2550. Compatible with popular PIXMA printers, see below for more info;. Canon Pixma MG2400. Canon Pixma MG2455. Canon Pixma MG2500. Canon Pixma MG2550S. Deskjet : 2620, 2630, 2632, 2633 2634, 3720 3730 3732 3733 3735. HP N9K06AE (304) Black x 1 (120 pages). Compatible with HP Printer Model HP envy : 5020, 5030, 5032. We are not associated with any printer and /or original printing supplies manufactured. CLX-4195FN CLX-4195FW CLX-4195N Xpress SL-C1810W SL-C1860FW. Polite, Professional AfterSales Back-up. Top Printing Performance as good as original. (Brother MFC-J5330DW MFC-J5335DW MFC-J5730DW MFC-J5930DW MFC-J6530DW MFC-J6930DW MFC-J6935DW. The picture is only for a reference, the actual item is the standard. from China. 2) It's suggested to keep your printer on if you often use it, as most printers start printhead cleaning automatically when reset, which will waste inks. (MFP M477fdw M452dn M452nw M477fdn M477fnw M452 CF410X. - Colour: Black. - Replaces: HP CF410XBK CF411AC CF413AM CF412AY. This is for a compatible product NOT an O.E.M product.). It`ll just take you 1 minute. Polite, Professional AfterSales Back-up. Top Printing Performance as good as original. 100mL of Pristine Fluid™. Syringe and tubing provided for cleaning nozzles. What's in the Kit?. Powerful dried inks and old print heads. - Apair of gloves (latex free). Safe for both Thermal and delicate Piezo heads. 1 X HP 301XL. ARE THESE REFILLED?. HP Deskjet 1000 Printer (CH340B). HP Deskjet 3000 Printer (CH393B). HP Deskjet 1010 Printer (CX015B). HP ENVY 4500 e-All-in-One Printer (A9T80B). HP ENVY 4504 e-All-in-One Printer (A9T88B). (1 x DR241 Black. This is for a compatible product NOT an O.E.M product.). - Colour: Black, Cyan, Magenta, Yellow. Quantity: 4. It`ll just take you 1 minute. 4 XXL TONER COMPATIBLE for Xerox Phaser 6510 6510 N WorkCentre 6515 6515DN,106R03480. 1x compatible for XEROX 106R03480. Xerox Phaser 6510DN. Xerox Phaser 6510N. Xerox WorkCentre 6515DN. Xerox WorkCentre 6515. 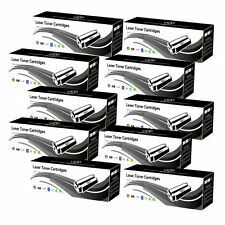 LaserJet Pro M252 M252n M252dw M252n M277 MFP M277dw MFP M277n. Polite, Professional AfterSales Back-up. Top Printing Performance as good as original. (Canon i-Sensys LBP-611Cn LBP-613Cdw MF-631CN MF633CDW MF635CX imageCLASS MF632CDW MF634CDW LBP612CDW. - Replaces:Canon045HBK 045 HC 045 HM 045 HY. - Colour: Black, Cyan, Magenta, Yellow. This is for a compatible product NOT an O.E.M product.). Canon PIXMA iP7250. - ORIGINAL Canon ink NOT included -. - Easy to refill - Less spillage. - 100% Compatible with any Canon series printer. 4 x Refill dye ink bottles ( Black, Cyan, Magenta and Yellow ). You are looking at the Best Refillable Ink Syste m (aka. Refill accessories included. 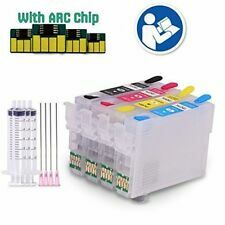 How do you refill the system when the ink runs out?. Just open the rubber stopper located on top of the ink container and pour the ink in the opening. ). 1 x T2914 - YELLOW empty refillable. ISO9001 AND ISO140001 CERTIFIED MANUFACTURER. UP TO 2 YEARS SHELF LIFE. VACUUM SEALED. Printhead for Z6100. Full range of HP Z6100, HP 91 inks also available, just ask. HP 91 Magenta Yellow. 1 x TN245 Cyan. 1 x TN245 Magenta. 1 x TN245 Yellow. - Replaces: Brother TN241BK TN245C TN245M TN245Y. - Colour: Black, Cyan, Magenta, Yellow. The orders are on the weekends will be dispatch on. Manufacturer Part No. :C13T673, T673, T6731, T6732, T6733, T6734, T6735, T6736. No need to wait — top ink off at your convenience. RICOH SPC430 | SPC431 | SPC440. 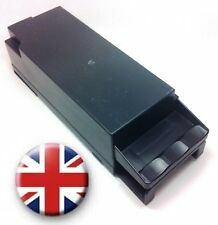 To fit RICOH Aficio SPC430 | SPC431 |. 1 x Black Equivalent to OEM No.821094. Yellow Toner for RICOH SPC430. Cyan Toner for RICOH SPC430. Magenta Toner for RICOH SPC430. The picture is only for a reference, the actual item is the standard. (2 x 202XL Photo Black. 2 x 202XL Cyan. 2 x 202XL Magenta. 2 x 202XL Yellow. This is for a compatible product NOT an O.E.M product.). COMPATIBLE PRINTER MODELS. It`ll just take you 1 minute. OKI ES9431 | ES9531. To fit OKI ES9431 | ES9531 Laser Printers. 1 x Black equivalent to OEM No.45536512. Yellow Toner for OKI ES9431. Cyan Toner for OKI ES9431. Magenta Toner for OKI ES9431. 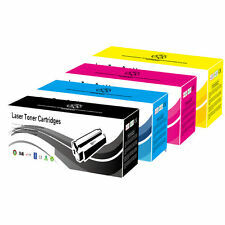 Toner Full Set for OKI ES9431. 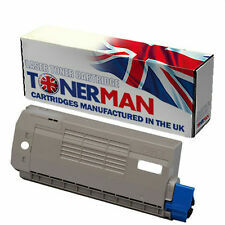 Toners for Xerox VersaLink C7000 | 106R03757 | Cyan, 10,100 pages, UK Reman. 1 x Cyan equivalent to OEM No.106R03757. To fit Xerox VersaLink C7000 | C7000DN | C7000N Laser Printers. Yellow Toner for Xerox VersaLink C7000. Toner Full Set for Xerox VersaLink C7000. Magenta Toner for Xerox VersaLink C7000. Colour combinations can be changed to whatever you like. (Example: 2 x Black, 1 x Cyan, 1 x Magenta). Important Information. Rest of the World. Managed By.